Bridal sample sales are an increasingly popular way for brides to shop for that perfect gown. Unlike real "sample sales", where manufacturers of clothing sell off designs that didn't quite make the grade or test production runs from the factory, most modern bridal sample sales are usually flash sales that happen in a bridal store or studio, and where you can purchase previous season stock, try-on models or even slightly damaged stock at a major discount. These are not events that suit every bride. If you want to spend a long time choosing your perfect dress, be pampered in a luxurious environment, have an assistant and a bunch of friends helping you pick styles and give advice, and just generally feel like a princess, then you might be best to stay away from a sample sale. But if you're a passionate bargain hunter who would love to get a gown worth 10x the price for a snip, and don't mind facing some chaos to achieve it, then this is the place for you! But like any bargain hunting exercise, there are secrets that can help you get the most from your trip! Here's our run down of the game plan! Advanced knowledge of what to expect from a bridal sample sale will always give you the upper hand. Each bridal sample sale is different - some can be quite civilised affairs with an allocated time slot, changing rooms, and a dedicated member of staff on hand, but many can be a free for all where you're diving through racks of stock with other brides, no changing rooms and very few staff to help. Some need you to book, some are first-come-first-served. Some only have limited sizes available, some have the full range. Some are cash only, some credit card only. Read as much as you can about the sample sale before you go, and unless otherwise stated, expect the maximum of chaos before you go, and prepare for that. The single biggest advantage you an give yourself over other shoppers is to be prepared before you go. Make sure that you know the type of gowns you'd like right from the start, and if you can try them on in advance then even better. Book yourself an appointment at a bridal store that sells those designs in advance, try on some gowns, and get an idea of the sizes and styles that you like so that you can dive straight in and grab them in the sale before anyone else. If that's not possible, make sure to spend time browsing the designer's website to get an idea of the kinds of gowns you'd like to check out. The more you can turn up with your mind full of potential matches the better. But try not to fixate on one gown too much - have a selection in mind - as you may find that the only gown you've picked is already gone, or not available in your size. You will need to be prepared to compromise to get the best deal. Finally, be prepared to walk away. There are no guarantees that you will get that perfect dress, even in the most awesome sample sale - so beware of day-after-regrets, and don't spend an inordinate amount of money on a dress you're not happy with. Most bridal sample sales will let you bring at least one friend or family member along too. Many will specify how many guests are allowed during the event. Make sure you bring along someone you can trust to give you honest feedback and tell you the truth. It's very easy to get carried away with an amazing price tag and not realise that you look like a pink blancmange - your BFF will need to point you in the right direction when that happens! It's common for changing rooms to be out of action during a bridal sample sale, or for them to be so busy that you'll lose out on valuable browsing time. Yoga pants and similarly tight bodywear is your friend, so that you can try on items without having to search for privacy. Certainly, avoid that frilly transparent bridal lingerie set you've been saving your wedding night - that's not for today! Also, make sure to bring some heels! If you're trying on a dress, slipping on some heels that are like the ones you're planning to wear on your big day can help you quickly make sure that dress is the right one for you. The early bird catches the worm, and that adage is never more true than at a sample sale. Make sure you get into the store early - in popular events there can be a queue for hours before it starts. Fashionably late just won't cut it here, and you'll miss all the best deals. Once you've narrowed down your selection to one or two items that you're sure suit you perfectly, and you're ready to make the final call, make sure to check everything thoroughly. Check for damage, missing frills or beads, marks or anything else that's amiss. Make sure you're confident in the size, and that you've factored in the pricing for alterations and adjustments if you're going to need them. Remember that most sample sales are final sale, and that there's no going back once you've made your mind up! Whatever happens, try not to take the event too seriously. The more you stress out about it, the less enjoyable it's going to be. You're there to possibly grab a bargain on the gown you've been eyeing, but you might walk out empty handed. Be ready for either outcome, go with the flow and enjoy yourself! Now you're ready to dive in, check out the latest bridal sample sales on Chicmi in London, New York, Los Angeles and San Francisco. Fashion brands can now more easily collaborate with other labels through Chicmi's free business-only distribution list. The Chicmi team are regularly approached by fashion brands looking for advice on hosting events in the cities we cover. Many of their questions relate to collaborating with other businesses - what collaborative events can I be part of, how do I get other brands to attend my events? We decided that it was time to build a fashion industry network to bring brands like these together, so that's why we're proud to announce today that we're launching our collaboration tools. We've built a business-only distribution list that brands can sign up to. You can choose exactly what sorts of events you want to hear about, the cities you operate in, and the categories of product that you can provide. You will then receive carefully vetted announcements - probably only one or two a month - from other labels seeking collaborators for their events. If you are creating an event then you can use the tool to announce your plans to the brands who have signed up. You specify the basics of your event - the type, the kinds of labels you're looking for, and provide a detailed description of what you're wanting the brands to contribute. We will then distribute it to the list. Head over to our collaboration page now to sign up or send out your announcement! Let's create a more collaborative fashion community! Chicmi are releasing a fashion trend report showing the state of the local fashion industry in each city. LONDON, 2017: Did you know that fashion events are more likely to open on the weekend in LA, the end of the week in London, and during the week in New York? That London has the most diverse selection of fashion events, while New York has almost twice as many sample sales? Or that London's men are far more engaged in the fashion events scene than New York and particularly LA? "The fashion scene in each of the cities is dramatically different, and all brands, but particularly young and emerging brands, often don't know where or when to host events or what the audience in each location looks like. We regularly get approached by companies looking for advice when planning events, and we hope that by releasing this data we can provide fact-based insight to help fashion brands get the most from their events." "With inner-city rents soaring and a few very large brands dominating the online market, we risk stifling the creativity of the fashion industry by excluding new designers. But it's these labels that push the envelope and drive the industry forward. Pop-ups and sample sale events are so important to provide a space for these brands to reach consumers who otherwise wouldn't know they exist - so we see the fashion events industry as the future of fashion as a whole, as it helps these new brands get discovered." The insights report is freely available online, published by Chicmi on their website at www.chicmi.com/london/stats/. The initial release of stats covers all of Chicmi's data for 2016, but the company will release monthly reports starting at the end of January this year to show how the industry is changing year on year. Say hello to San Francisco! Happy New Year! As a special present we're brining you an all new San Francisco fashion calendar! We've been building the most comprehensive fashion calendar in London for just over a year and a half now, and we've been in New York and LA for a year. These cities have been booming, and hundreds of thousands of people use Chicmi on a monthly basis to explore the fashion scene around them. This is why we're extra excited to announce that we've started working on a San Francisco version of our site, and you can start using it straight away. Like with the other cities, we'll be covering all of the fashion sample sales and shopping events, and also all of the cultural and social events, exhibitions and industry events. 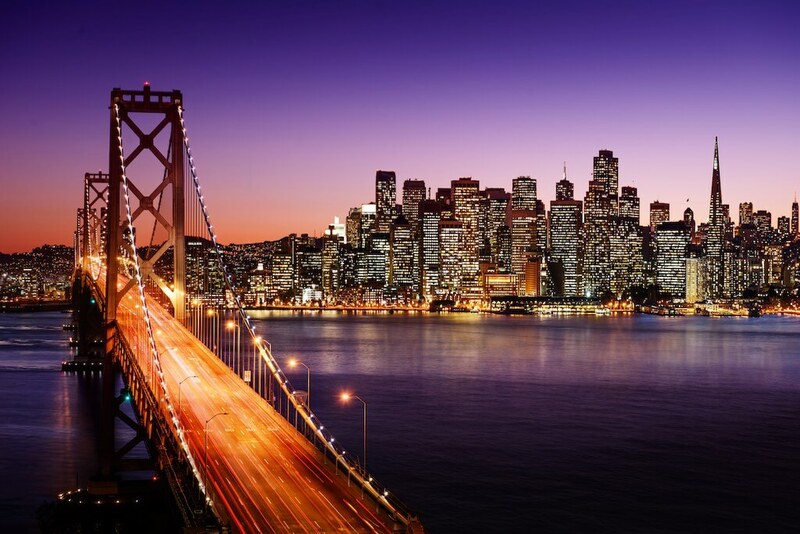 We love San Francisco, and we can't wait to explore what the city has to offer with you! Head across to our San Fran site now to start your journey! We know how hard it can be to keep track of online sales! You either sign up to every mailing list under the sun, or you miss out on that all important discount that you've been waiting for - and in the meantime you find yourself hit by a deluge of constant mailing. It's still a very new feature and we're going to be testing and it and improving it as we go, but the idea is to provide a quick, at-a-glance and completely transparent list of online sales which deliver to your city. It's ranked 100% by popularity (i.e. how many people click on each link), and unlike some other similar list out there we include all online sales that we know about, regardless of whether we have a relationship with that brand or not, so you can be sure that the list is a completely honest reflection of what's out there. 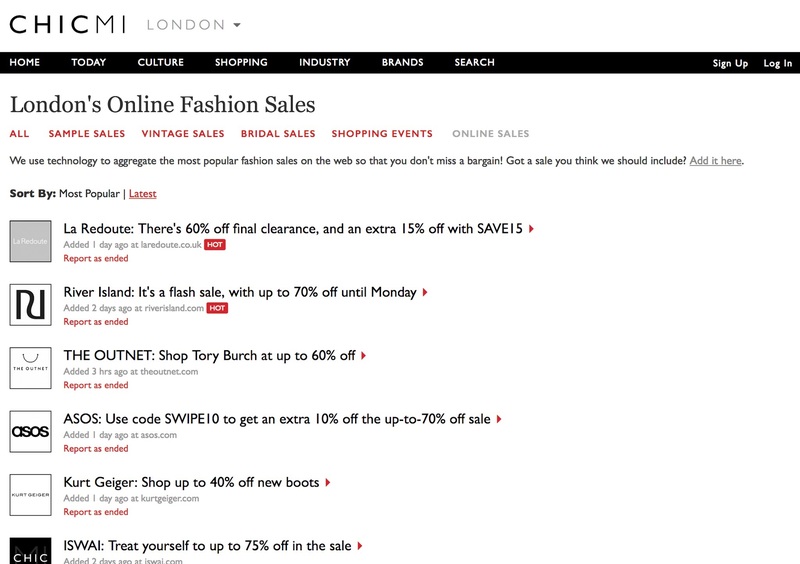 If you've found an online sale that we don't know about, head down to the bottom of the list where you can submit tips. And if you find a particular sale has ended when you click on it, hit the "Report As Ended" link against that entry and we'll review it and remove it! Let's work together to build the best online sale tracker on the web! Get started now.